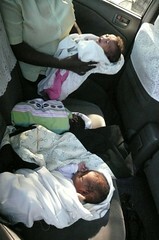 Friday 2nd May 2008, 9.15am local time, getting the plane at 7.30pm from Mombasa to Nairobi connecting to Amsterdam and onto Manchester, please come to Coast General Hospital where four babies are ready to be discharged into your custody at the orphanage. Nico, one of our Kenyan trustees had spent the previous three days working with the local children’s department making sure everything was in place for the release of the babies. There was just four more signatures to get from hospital personnel but unfortunately the lady who signs the release forms first & sets off a chain of signatures was in a meeting, Caroline the young social worker went from office to office getting everything in place and at 3.15pm we were allowed into the nursery to pick up the babies. Little Kay is only 1.7kg, a premature baby who was abandoned in the hospital when the mother realised the baby was in poor health but a proper little girl she has battled and now is gaining weight. Roisin a 17 day old little girl who was abandoned shortly after birth but due to the timescale between the birth and when she was found by a good Samaritan, she has been traumatised but thank God she is doing well. Baby Paul, aptly named after one of the best footballers in the world, Paul Scholes, a lovely little boy abandoned shortly after birth and about two weeks old. We have very high hopes for this young boy, a professional footballer maybe. 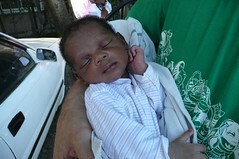 And finally Komoto, a beautiful young girl who celebrated her 1st Birthday on 3rd May at the orphanage. Komoto was born with a large growth on her skull, her mother left her shortly after birth and she has been in Coast General Hospital since, no other home would take her due to the birth defect. She cannot sit up but her new housemother Jane is spending time exercising her lower back and legs. Over the next six months we will have a neurologist examine Komoto and hopefully there maybe some surgical procedure to remove part of the growth. Either way she will spend a very happy, peaceful life in the orphanage being well looked after and receiving love & affection from her new family in Flynn House. Rosemary &Phelim; P.S It would be much easier to transfer money to the school and the orphanage via internet.